The mezzo, Christina Angelakova, was born 29 October 1944 in Isperich. Following lessons with Sima Ivanova in Bulgaria she travelled to Milan to study with Gina Cigna. 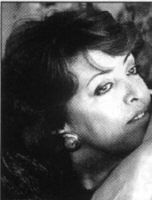 Her long career with the Sofia National Opera began in 1967 with her stage debut in Xerxes by Handel. During 1973 she was a prizewinner in the International Competition for Young Opera Singers in Sofia. Soon an international career developed at La Scala in Milan, the Deutscher Oper Berlin, the Hamburg State Opera and in Brussels, Mexico and Venice. In 1987 she sang Amneris in a production of Aida at the Temple of Luxor. This role was repeated with the Deutscher Oper Berlin in 1988. Major roles in her career included: Amneris, Azucena, Ulrica, Eboli, Laura in Gioconda and in the Russian operas of Tchaikovsky and Glinka. Her repertoire extended from Gluck to Stravinsky. Glinka: A Life for the Czar "Aria of Vanya -Act 4"
Tchaikowsky: Maid of Orleans "Aria of Joan"